These numbers are based on manufacturer quoted values for a simple frank and are for comparison purposes only. The number of impressions can be greatly affected by printer model, print volume, batch sizes, the number of times mail is processed in a day, graphics and environmental conditions. This cartridge is a direct replacement for the Pitney Bowes version. Manufactured to strict quality standards, these premium cartridges produce high quality franking prints and are very reliable. Can you get blue ink for a K700 series franking machine? Does the compatible cartridge you have for the Pitney Bowes K700 printer replace the 797-0RN cartridge? Yes, we currently stock a compatible red Pitney Bowes 797-0 ink cartridge which can replace the Pitney Bowes 797-0, 797-0RN or K780002 ink cartridge which are all variations of the part number for the same cartridge. Is it possible to use a blue ink cartridge for my Pitney Bowes K700 Mailstation? I have a franking machine that uses ink cartridge number 797-0SB. Can you please give me the alternative, as it's very expensive bought direct? Do you supply cartridge 797-OSB for a Pitney Bowes DM50 machine - blue ink? The top of the compatible red Pitney Bowes 797-0 cartridge you sent me is different to the Pitney Bowes 797-0 ink cartridge. I haven't taken it out of it's seal in case it's the wrong one and I can't return it. Can I try it and see if it's the right one and if it isn't can I still return it for a full refund ? Will my compatible Pitney Bowes 797-0 ink cartridge work? The Pitney Bowes K700 uses the compatible 797-0 - (K780002) ink cartridge. Before installation please confirm that your printer model or the code K78002 is listed on the box. Providing that this is listed there should be no problem installing the cartridges. We understand that the top of the cartridges do look different but this is due to copyright reasons. Do not hesitate to contact our customer care team if you require further assistance. Crystal clear, crisp printouts are what the Pitney Bowes K 700 is renowned for. As a matter of course your Pitney Bowes K700 will run dry of printer ink, and when it finally does happen you'll quickly discover that fresh Pitney Bowes K700 ink is often quite pricey. Fortunately you don't need to waste your time worrying about dishing out the steep asking prices you'll find on the main street because here at Cartridge Save you can find all the Pitney Bowes K 700 cartridges you will ever want at very low prices. Save more money on your ink by buying online with Cartridge Save! It makes no sense to fork out so much for the K-700 original cartridge or K700 compatible ink down the high street when it is easier to save a fistful of cash buying online with Cartridge Save. You can have one hundred per cent confidence when you buy your Mailstation K700 ink cartridges from us as they are all guaranteed by a hassle-free money back guarantee. Don't forget that each and every purchase also has free delivery, typically arriving the very next business day! 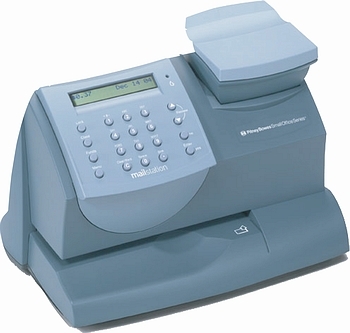 A part of the manufacturer's 'Mailstation' series, the Pitney Bowes K700 offers a reliable machine for franking mail. It is an ideal choice for offices and small businesses that send out a huge volume of mail on a daily basis. It does not just cut postage costs – the Pitney Bowes K700 franking machine also allows the company to advertise its products and services with its customisable envelope messages. Ink cartridges for the Pitney Bowes K700 are easy to find. Measuring about 351x264x231 mm, the Pitney Bowes K700 franking machine is an ideal desktop companion. It is not as heavy as it looks, weighing only 4 kilograms. The Pitney K700 even features a built-in scale for weighing parcels and letters. The Pitney Bowes K-700 franking device is likewise designed to accommodate various types and sizes of envelopes, labels, and parcel packaging. The main advantage that the Pitney Bowes K700 brings is increased savings on mailing and postage expenses, especially since users are constantly alerted of discounts. Users of the Pitney Bowes K700 Mailstation won't need to make frequent trips to the post office to purchase stamps, allowing them to save money and reduce their time and effort spent on buying office equipment . The Pitney Bowes Mailstation K700 franking machine is a practical tool for offices or businesses that do a lot of mailing. However, the K700 is relegated to an impractical and even useless accessory for those who only send mail on occasion.